I do not know what my problem is, but it seems as though I cannot consume my bananas before they hit that nasty, brown, spotted stage. Maybe I subconsciously let them turn that way so I have an excuse to bake. Well, whatever the reason I had some bananas to use up, so I hit up allrecipes, dug into my recipe box and made one of my favorite Banana Bread recipes. I had all of the ingredients on hand, so I whipped this baby up in no time making some very simple revisions. 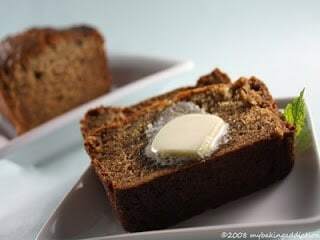 The recipe is super easy and yields a deliciously moist banana bread. I added some cinnamon, nutmeg and vanilla to give it a little oomph and impart a touch of fall. This bread is great toasted, slathered with whipped butter and served with a piping hot cup of coffee or tea. I hope you enjoy this one as much as I do! 2. In a large bowl, combine flour, baking soda, cinnamon, nutmeg and salt. In a separate bowl, cream together butter and brown sugar. Stir in eggs and mashed bananas and vanilla until well blended. 4. Bake in preheated oven for 60 to 65 minutes, until a toothpick inserted into center of the loaf comes out clean. Let bread cool in pan for 10 minutes, then turn out onto a wire rack. Looks wonderful! We can’t seem to eat up all of our bananas in time either. 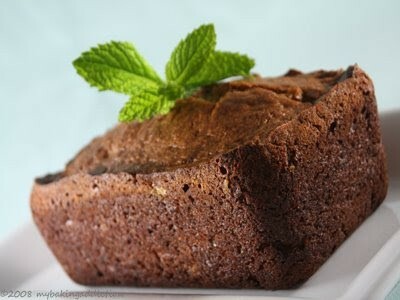 Great luck for us that banana bread is even better than plain bananas! Your spiced up version looks fantastic — especially with that butter on the top! mmm.I am alllll about banana bread! The banana bread looks delicious. And you’re right, the more over-ripe the bananas are, the better the taste. Great recipe. Thanks for your comment on my Impulse Buy! I sooo need to get my KA ice cream attachment to I can make some vanilla ice cream! Me and fresh bananas don’t work out well either. But I do love banana bread and muffins! Thanks for the recipe! I made this tonight, but added walnuts. Tastes great. Reminds me of the recipe my aunt made for us back in the day. It was my first time making banana bread. Thanks! I am so happy to hear you enjoyed the recipe, thanks so much for stopping by and leaving your feedback!